The Housing Authority of the Cherokee Nation (HACN) administers many programs including College Housing Assistance, Mortgage Assistance Program (MAP), Community Shield Insurance, Rental Assistance Program, Low Income Rental Housing, Senior Housing and New Home Construction. To learn more about HACN programs and services, visit http://www.hacn.org/ . As of the HACN Report ending Januaryy 2015 to Tribal Council, 148 new construction homes have been built in total by the HACN since Chief Baker took office almost four years ago. To call any HACN office, call (918) 456-5482 or 1-800-837-2869. The old phone numbers will no longer work. All emails now end in hacn.org. The Area 2 HACN office serving Craig, Nowata, Rogers, Tulsa and Washington Counties is physically located at 23205 South Highway 66, Claremore, OK 74019. The mailing address for the office is P.O. Box 1325, Claremore, OK 74018.
Business hours are Monday through Friday from 8am to 5pm. For issues concerning HACN programs, you may contact either the HACN Board of Directors which includes Bobby Mayfield, Ron Amos, James Simmons, Tony Yates and Joshua King, Chief Baker and/or your local Councilmember. I went to the Pryor Baseball Tournament for the High School JV squad. The boys won the tournament. They beat the Claremore Zebras 7-4 in the first game. They lost to the Coweta Tigers 3-0 game two. They beat the Bartlesville Bruins 2-1 to win there side of the bracket, and they beat the Pryor Tigers 3-0 to win the tourney. Ted Note: Kerry Jackson provided a bunch of excellent photos from the Pryor Tournament ... but I am way too far behind at this time of year to process all of them. I've included the detail he supplied with them below. The varsity and JV teams are scheduled for team photos Monday the 13th when I will also hopefully get a full JV roster. Since you are swamped, I figured I would give you a few photos to pick from with the highlights below so that you can list them out however you like. Trailing by 1 run, (#20) Alex Austin hit a massive and crucial home run with bases loaded to recapture the lead and secure the victory over the Claremore Zebras 7-4 in the first game. Cardinals lost to the Coweta Tigers 3-0 game two. Collisville beat the Bartlesville Bruins 2-1 to win their side of the bracket. (#6) Kyle Burch pitch the entire Championship game, holding the Pryor Tigers scoreless to win the tournament 3-0. 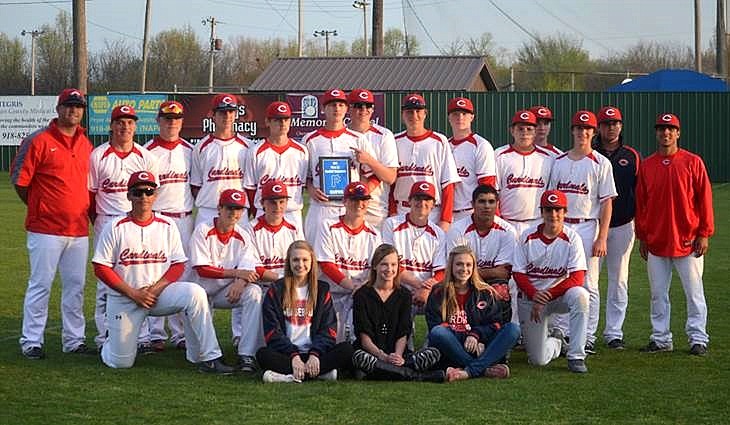 Team photo with Championship plaque after winning the Pryor Tournament. Coaches Hernandez and Underwood posing with (#6) Kyle Burch after his pitching helped shut out the Pryor Tigers in the Championship game. (#9) Jake Badgwell surrendering to the Pryor 3rd baseman in the Championship game. 1st Baseman (#11) Cale Crutchfield leaping to save the throw to first while Catcher (#15) Addison Lutz runs to back up the throw. Pitcher (#6) Kyle Burch delivering another strike. Pitcher (#18) Trent Flanagan throws a pitch so pretty it left #18 for the Claremore Zebras awe struck. (#17) Kevin Cooper squaring for the bunt against the Claremore Zebras. (#13) Travis Hardison watching an outside pitch skip into the catcher's mit. (#16) Cody Miller loaded up and ready to unleash on this meatball. 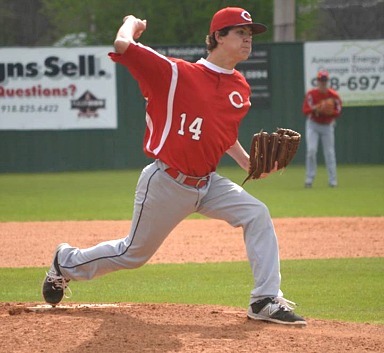 Pitcher (#14) Kyle Jackson spins on the mound to get a quick pickoff at 1st. #20 Alex Austin posing after yet another big hit including a grand slam, bases loaded homer over the deep center field wall in game 1 vs. the Claremore Zebras. Here are a couple of pictures from the reception we had today at the middle school for our Teacher of the Year, Taylor Wheeler! Stephanie Stehl submitted these photos (taken by her dad) of 7th grader Sabrina Stehl at a recent JrHi track meet.